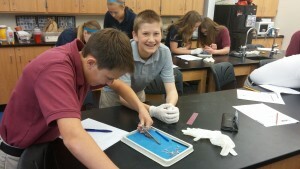 7th graders get to dissect worms and frogs in science class, they learn about ancient cultures in history, they read a lot and use computers to share projects about their reading, plus they use the Six-Traits of Writing to create and revise their writing pieces. We try to be intentional about learning how to critically evaluate writing. During our Bible study time, we focus on the Old Testament. What type of development typically occurs in this grade? Seventh grade sees a lot of social development among peers as well as between youth and adults. Students at this age also develop their decision making abilities which also increases student ownership and responsibility in regard to how to use one’s time. Moving from concrete to abstract thinking and developing higher level thinking skills is a main goal during 7th grade. I love the interaction with the kids…..engaging them in learning and conversations and seeing their sense of humor in play. I also enjoy watching their relationship with Jesus Christ deepen.